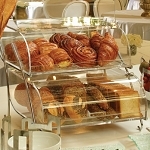 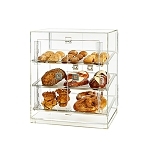 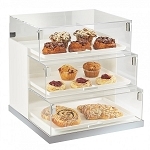 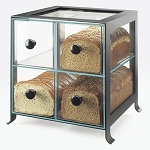 Countertop Bakery Displays allows your baked items to be placed at eye level so customers can easily shop. 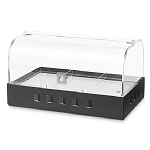 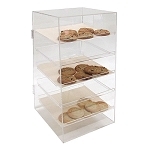 There is a wide range of acrylic cases that are clear for unhindered viewing. 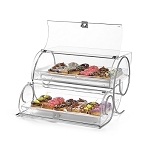 Showcase all your freshly created items such as; Bagels, Breads, Pastries, Pies and Pie Slices, Cakes, Muffins, Cupcakes, Eclairs and more. 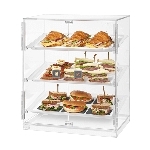 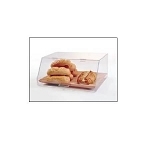 Acrylic Rectangle Display Tray - 18" x 12"
Stackable Bins Cases With Drawers Self-Serve Options Bamboo Framed Multiple Tiered Assistant Serve Displays Choose from stackable bins or cases that go well side by side. 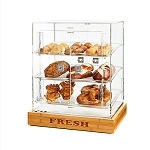 Also, there are many that have drawers in them to separate products so the taste stays fresh. 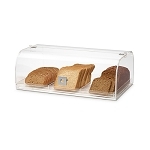 There are clear cases that are framed with dark bamboo which create a beautiful finished look and will look wonderful atop your counters. 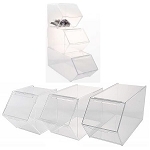 Cases come with a couple different styled fronts, straight, curved and tiered options to best fit your décor. 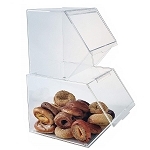 We offer everything from the simple, basic bins to larger cases that come with several shelves that customers access through doors. 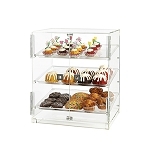 Depending on your set up patrons can be totally self-serve or attendants can wait on them for everything, or shake it up and have a mix. 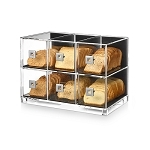 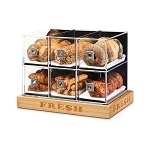 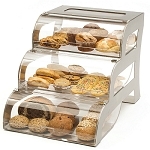 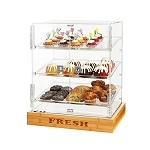 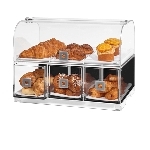 You can tickle and tease both sight and smell with these clear bakery counter cases.